Striking Thought's post on Captain Kirk's fighting prowess immediately conjured up images of his first officer's skill in Vulcan kyushu waza. 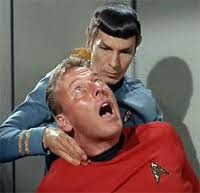 Kirk was a hack compared to Mr. Spock. Now if I can just figure out this mind-meld thing Spock does I'm in business. *Lawrence A. Kane and Kris Wilder 2005. The Way of Kata: A Comprehensive Guide to Deciphering Martial Applications. YMMA Publication Center.